Wusthof knives are crafted in Solingen, Germany, precision forged with a full tang, high-carbon stainless steel with bolster for balance & weight. Wusthof knives feature a 14° cutting edge on each side, reducing the drag when slicing through foods, allowing for seamless effortless cutting. Each knife blade is completely buffed & polished by hand. 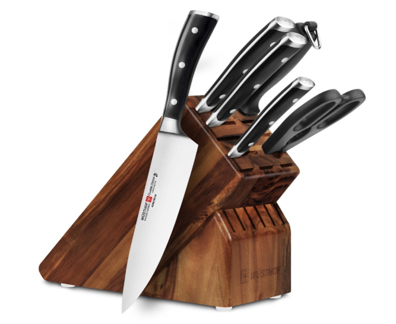 Set includes 3.5" Paring Knife, 6" Utility Knife, 8" Bread Knife, 8" Chef's Knife, Honing Steel, Come-Apart Kitchen Shears, & 15-slot Knife Block.